Walk into the homey Hintonburg Public House at, say, noon, and pull up to the bar on a painted blue chair. Then stay there until 2 a.m., and you’ll witness a microcosm of the changing nature of the neighbourhood. Waves of people come and go: young families, blind dates, retirees, hipsters, students, artists, amateur musicians, crafters, crews of co-workers, post-Pilates people, lunching ladies, late-night revellers. 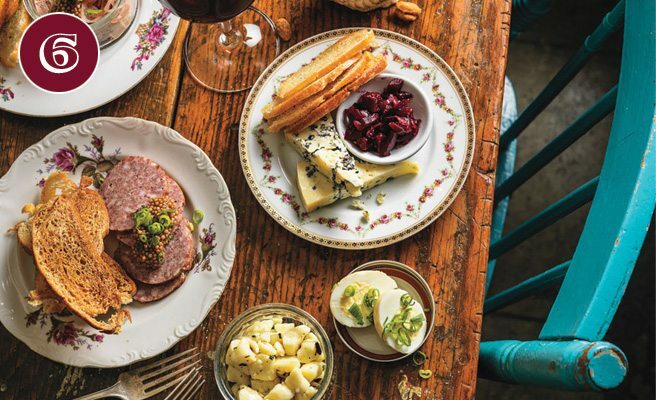 The HPH — as regulars call it — has indeed become just what owner Summer Baird envisioned when she chose the name: it’s the very essence of a neighbourhood local, an old-school hangout with a modern twist. Baird has taken to calling it a community pub — and for good reason. Where else can babies and barflies so seamlessly coexist? HPH teeters between several worlds: a notch up from the average watering hole or burger joint and a notch down from casual fine dining — a realm intimately understood by Baird, who was once co-owner of upscale bistro The Urban Pear. 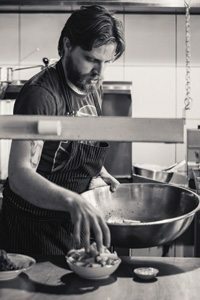 The downside of being a pioneer in a relatively rare restaurant category is that inevitably some customers will have trouble curbing expectations.Unlike its more food-centric counter-parts (think The Wellington Gastropub or The Whalesbone) HPH is not based on the traditional three-course format. The doors stay open all day, every day of the week, dishing out the same pub(ish) menu for lunch and dinner (plus a brunch menu on Saturday and Sunday). Kids can get scaled-down cheeseburgers or a souped-up pizza with double-smoked bacon and kale, with a side of (bless them) broccoli. The HPH also serves up a late-night menu that’s especially popular with the city’s cooking community in search of a pint and a bite after their shifts. People swing by for open-mike nights, beer tastings, dance parties, and art exhibits. For those who pull in for a beverage between meals, little bar snacks are always available — pickled eggs and marinated cheese curds that go down easy with the local microbrews or a glass of wine. Baird has created a fluid and flexible space with warm, modern-vintage decor that behaves like a living gallery space in which every visitor contributes to the evolving scene. If that means the food doesn’t blow away the critics, that doesn’t bother Baird. I imagine she has learned a thing or two over her career about making compromises (after all, between her two restaurant ventures, she ran a home daycare). 1020 Wellington St. W., 613-421-5087, www.hintonburgpublichouse.ca.